Published: Aug. 30, 2012 at 10:56 a.m. 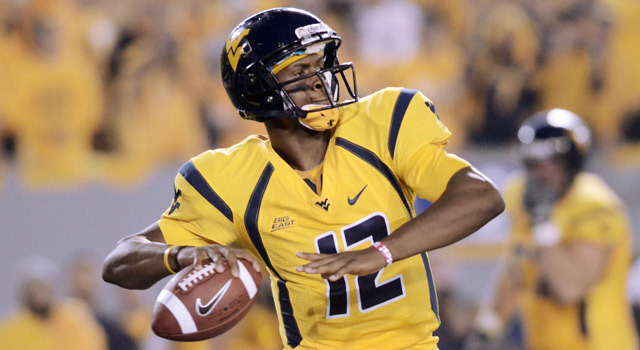 Updated: Sept. 3, 2012 at 05:35 p.m.
West Virginia's Geno Smith is a do-it-all quarterback with a shot at winning the Heisman Trophy this season. The chase for the Heisman Trophy is similar to a NASCAR race, with candidates' reputations determining pole position as we head into the regular season. However, the award ultimately will go to the playmaker who shows he has the sizzle to match the hype while helping his team mount a serious title run. With those benchmarks set, let's take a look at 12 potential candidates to win the award in 2012. When Barkley made the surprising decision to return for his senior season, he shot to the top of the list of Heisman contenders. He was absolutely sensational in 2011, racking up 3,528 passing yards and 39 touchdowns while giving up just seven interceptions. With a supporting cast featuring some of college football's best playmakers at wide receiver and running back, Barkley could put up ridiculous numbers on a marquee stage in Los Angeles. Jones is underappreciated as a potential Heisman winner following his disappointing finish in 2011, but he could quickly re-emerge as a frontrunner by directing the Sooners offense on a run to the BCS title game. Jones has several playmakers on the perimeter who are capable of getting down the field, including receiver Kenny Stills, and we could see Jones make plenty of splashy plays. Smith and the Mountaineers hung 70 points on the Clemson Tigers in the Orange Bowl, so you can be sure he's squarely on the radar of scouts and coaches looking for the next dynamic, game-changing quarterback. Smith isn't a dual-threat playmaker in the Mountaineers' version of the spread offense, but he is a pinpoint passer who can punish opponents with his accurate srikes. West Virginia is poised to challenge for a Big 12 title, and the national recognition that follows could vault Smith into contention early in the season. Boyd put up phenomenal numbers as a first-year starter leading the Tigers' high-powered offense. He accounted for 4,000-plus yards of total offense in 2011, producing 38 touchdowns through the air and on the ground. Driving a scoring machine that routinely puts up 50-plus points in games, Boyd will have plenty of opportunities to showcase his diverse skills as a playmaker from the pocket. Lattimore has been hailed as one of the best runners in college football after dominating the SEC over the past two seasons. He is recovering from a torn anterior cruciate ligament, and that might rob him of some explosiveness. But Lattimore could produce enough as the Gamecocks' workhorse to lead the SEC and vault to the top of the list. Ball will have a tough time surpassing his remarkable 2011 campaign, in which he had the most rushing yards (1,923) and yards from scrimmage (2,229) in the NCAA and matched Barry Sanders' record for touchdowns in a season (39). But thanks to the Badgers' suspect quarterback situation, he'll be counted on to carry the offense as the featured runner, and we could see a host of 100-yard games and touchdowns. If Ball comes close to matching his totals from last year, it will be hard to keep his name off the trophy. The most electrifying player in college football blazes the turf in Death Valley on a weekly basis. Watkins rewrote the ACC record book as a freshman, and he could continue to raise the bar as the Tigers' top weapon this season. He was suspended by the team for two games after an offseason arrest on misdemeanor drug possession charges, and that might impact voters' opinions. But the weekly splash plays Watkins produces could push his off-the-field transgressions into the rearview mirror by season's end. Barner gained 1,123 yards from scrimmage while backing up LaMichael James last season. Now he gets the opportunity to be the primary playmaker in a Ducks' attack that will certainly rank as one of college football's best. Oregon's spread offense will showcase Barner's combination of speed, strength and quickness, and he should produce a number of highlight plays that will linger in the minds of voters. The Ducks are also positioned to make a legitimate title run, giving Barner the platform to be a dark-horse candidate for college football's prized honor. Robinson directs the Wolverines' offense like a magician in the Big House, but there is nothing mysterious about his game. Robinson is an explosive improvisational playmaker with outstanding running skills. He's also developed into a dangerous passer capable of connecting for big plays. His game is not aesthetically pleasing to traditionalists, but Robinson is a human highlight reel with the potential to produce big numbers in the Big Ten. Based on the public's affinity for quarterbacks, Davis might be overshadowed by his teammate, Tyler Wilson. But there is not a more explosive runner in college football. Davis has all of the tools that coaches look for; posting huge numbers against SEC defenses will raise his profile as a potential Heisman candidate. Price quietly developed into one of college football's top dual-threat quarterbacks as a first-year starter for the Huskies in 2011. He displayed excellent arm strength, touch and accuracy from the pocket while also showing athleticism and mobility. He's had a full offseason to master the nuances of playing the position, and Price could eventually factor prominently in the Heisman discussion. The highly-regarded Thomas is not a likely Heisman candidate, but if he guides the Hokies to the BCS title game, that could enhance his chances with the voters. He has shown impressive skills as a dual-threat playmaker, and his ability to deliver sizzle plays could create enough momentum for him to nab the trophy.